The ProMariner ProTournament 360 Elite Quad 52038 is one of the fastest battery chargers with the most features in its class. Specifically designed to deliver maximum charging performance and extend battery life. Get on the water first and stay there longer with tournament winning technology providing: 100% charge upon completion of multi-stage charging process. 100% charging output with AC power as low as 90 VAC. 50% lighter and 2 to 3 times faster than traditional chargers. Give your batteries what they demand with ProTournament Elite’s three (3) digitally selectable performance matched” 5-stage charge profiles. Using 100% of the available charging amps, ProTournament Elite’s Distributed- On-Demand™ Charging technology will always distribute its full charging output to the combination of batteries connected to it as required by the discharge state of each battery. 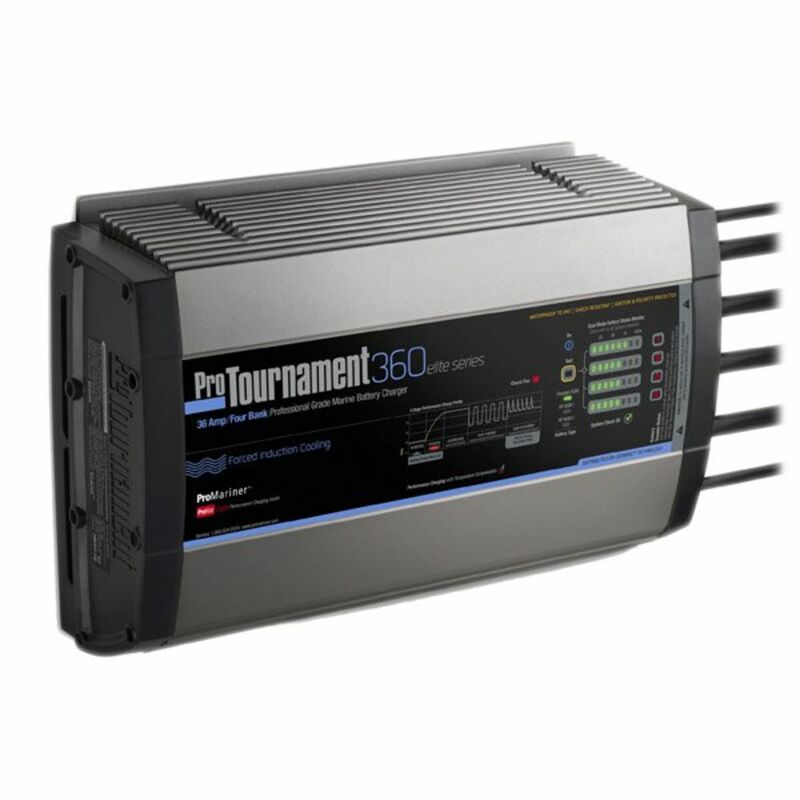 Tournament Winning Technology - 100% charge upon completion of multi-stage charging process. 100% charging output with AC power as low as 90 VAC. 50% lighter and 2 to 3 times faster than traditional chargers. Forced Induction Cooling (360 Elite models only) - Concealed waterproof fan provides forced air cooling for cooler operation & fastest charge times. Digital LED Display with Dual Mode Battery Status Monitor - Intuitive LED display with charge mode indicators and real time charge level status with an on-the-water push-to-test feature for percent of battery power remaining. Waterproof Connector Port for Optional Status Remote - Optional tri-color LED charge mode status remote can be placed up to 12’ away from the charger. Digital 5-Stage Charging with Temperature Compensation - Analyzes connections and the ability for a battery to accept a charge, advance high fill rate charging, conditioning, auto maintain (energy saving mode) and automatic once a month storage recondition mode automatically monitors ambient temperatures and adjusts its charging output. System OK & Individual Battery Trouble Status Indicators - Advanced technology eliminates time consuming trouble shooting by clearly indicating system and battery connections are OK or if a fault is present on a specific battery bank. Built-in Safety & Pre-Wired for Easy Installation - Shock resistant, space saving extruded aluminum design, dual in-line DC safety fuses for trolling motor and house batteries, over-voltage, overload, over-temperature, reverse polarity and ignition protection. *Free ground shipping is for the lower 48 states only. Do you own the 52038? Please, tell us what you think about it. It helps us provide you with better products. Please note that it may take up to 72 hours for your review to appear.